Makayla McCarthy (El Cajon, Calif.) was named the CACC Rookie of the Week while playing for Wilmington University softball in the Central Atlantic Collegiate Conference Players of the Week, as announced by the conference office on Monday. After playing the week in Florida, McCarthy went 2-2 in the circle in 23 innings pitched, striking out 14 with only six walks. She finished up with a 2.43 ERA while batting .250 for the week with five RBI. 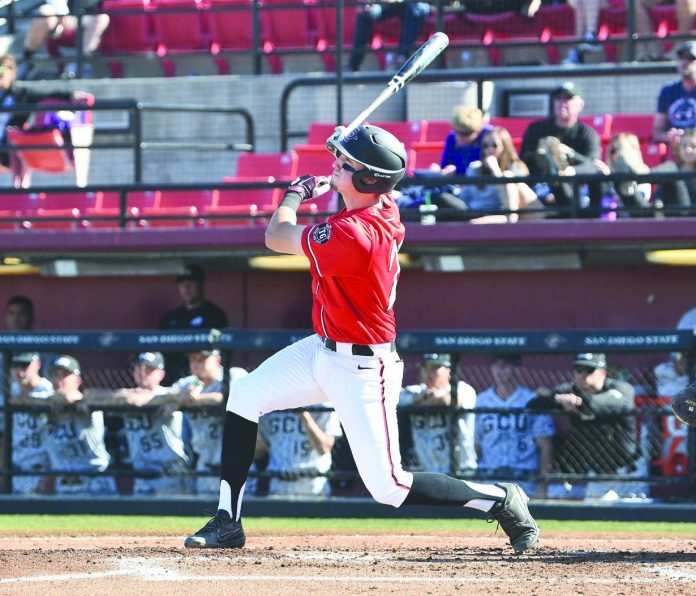 San Diego State infielder Jordan Verdon (Granite Hills HS) was named one of nine Collegiate Baseball’s National Players of the Week announced Monday morning. Verdon hit .471 (8-for-17) for the week, with six doubles and nine RBI. In each of the four games, Verdon recorded at least two hits, one RBI, and one extra-base hit. Verdon launched into the week with a 2-for-4 showing at San Diego last Tuesday. In the series opener against Cal Poly on Friday, Verdon grabbed a new career high with four RBI against the Mustangs to push SDSU to their 9-7 victory.